Jannai shares the responsibility of morning exercise, intramurals, recreation opportunities, teaching of health and wellness classes, and risk management. As a former teacher in the public school system, Jannai has been coaching students to make healthy life choices and helping find ways to better themselves as young individuals. Native to Indiana, Jannai spent three years of college as the Ball State University Recreation Intern. Supervising and learning business management. Completing her internship with several after-school programs such as the Boys and Girls Club, YMCA, and the Buley Center of Muncie. 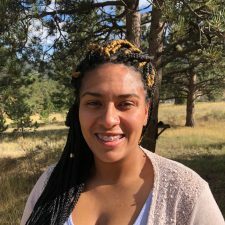 She also, comes from a three year background in residential treatment/detention facility (Youth Opportunity Center) and seven years of the public school system, teaching and coaching various sports such as volleyball, basketball, and track, where she was responsible for encouraging youth to engage in physical activity and to be a part of something bigger than themselves. Jannai earned her undergraduate degree in organizational communications at Ball State University (IN). Jannai has migrated to the Estes Park area for the upcoming trimester and plans to move on campus when the new housing is built. Students inspire me when they are in their element and following their passion. My favorite thing about Eagle Rock is the sense of the community and the bonds I have already made with staff and students. My rock is my mother. She encourages me when I don’t have the strength to push myself. I really love sports and my students they bring me happiness. I’m really moved by those who take a stand in what they believe in with love.